If you have several iPhones, iPads, or iPods that need updating to the latest version of iOS, you can use a nice trick to save some bandwidth and download a single iOS update file to apply to multiple devices from either Mac OS X or Windows. This is a perfect solution for a family that has multiple iPhones or iPads that need updating, particularly when you don’t want to download the same firmware multiple times. To be clear, the iOS devices must be of the same type and model, meaning three different iPhone 4s can use the same firmware, but an iPhone 4 can’t use the same update file as an iPad 2 would, and an iPod touch can’t use an iPhone 4S update file, and so on. Same models use the same IPSW, different models need different IPSW. To do this, you will need to download the iOS firmware files directly from Apple. 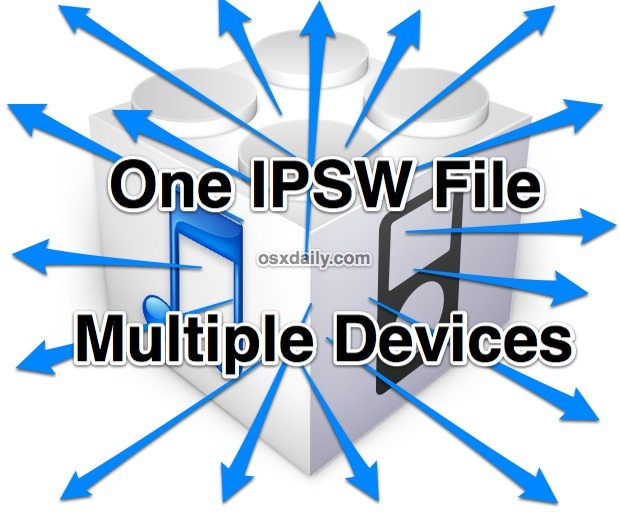 Here are firmware links for iPad, iPod touch, iPhone if needed, once you have the file you place them into the folder where IPSW files are stored locally. Here’s the process for Mac OS X and Windows, and yes you can use an IPSW file downloaded on a Mac or PC to update an iOS device connected to a different PC or Mac, the files are platform agnostic. That’s all there is to it, and here’s how it works; anyone can download the updates without iTunes by using direct firmware links from Apple’s servers. Once you have the firmware file you can either use the standard method of using .ipsw files with ALT/Option clicking Restore, or use the approach outlined above which fools the computer into thinking it downloaded the iOS update itself, which will then immediately unpack and start the iOS upgrade process upon the launch of iTunes. Don’t forget about OTA updates either, which allow iOS to download and update only the changes between releases. The resulting OTA update can often be 1/12 the size of a full firmware file, and although they can’t be shared between multiple devices the small size of the on-device update can make it a valid choice for the bandwidth conscious. Thanks to AJ & NeverEnuf for giving the idea for this great tip in our comments. Why put it into the directories when you can just OPTION-CLICK the Restore button in iTunes and select your ipsw file to achieve the same results? Seems an unnecessary to me. Yes. Right idea, but perhaps an over engineered solution. iOS updates over the air now? This seems like a bunch of work for nothing…. however I know depending on if you have 400 iphones to update or not….. When I download the file, I end up with zip file. Itunes does not pick this up. Even if I renam it with .ipsw at the end of the zip file, still nothing. Am I missing something? what about describing steps to downgrade. i’ve got a iOS 6 devices that i need to downgrade to ios 5 for testing reasons. i upgraded too many developer test devices in work so need a few to go backwards. is the process above valid because its not working for me. You forgot to say that you hit Command + Shift + G when you are IN FINDER, took me a whole 15 minutes to figure this out. Got all that, but what do you mean (by drag and drop) into the appropriate location? Thanks, have a bunch of devices to update. What nobody seems to know is where are IPSW files stored when you use your iPhone to download and install. Everyone knows where they are stored on a pc or Mac, a simple *.ipsw search with hidden files etc unticked will find the files but what about downloading onto the iPhone, where is it stored then and can it be accessed.